This article is about UFOs in general. For Shroobs' spaceships, see Shroob UFO. For the UFO-like enemy from Super Mario Land 2: 6 Golden Coins, see No.48. 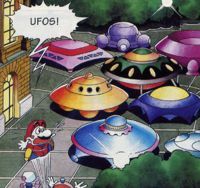 UFOs in a parking lot in the Club Nintendo comic "Sag niemals Holerö". UFOs (Unidentified Flying Objects) or Flying Saucers are the basic means of transportation for aliens. UFOs are high-tech vehicles that can travel large distances in space. There are also many different kinds and shapes some look like saucers (hence the name) and others look like squares. Super Mario Galaxy contains many flying saucers that appear mainly in Battlerock Galaxy and Dreadnought Galaxy. These UFOs have their own gravity, and Mario and Luigi can walk on the top and the bottom. Two crashed UFOs float on the Lava Planet in the Melty Molten Galaxy; one of these can be walked upon. These UFOs seem to be in the possession of the Topman Tribe, due to them commonly being found on or around them. The bosses Topmaniac and King Kaliente are fought on UFOs, but only for the first fight in the case of the latter. Additionally, in the intro cutscene, Bowser calls a single UFO to dig the Princess Peach's Castle surroundings before lifting it. The same UFO appears flying around the Peach's Castle in the cutscene traveling to Bowser's Galaxy Reactor. It is not seen being sucked into the black hole at the end of the game, however. The Starshrooms act much like UFOs, floating while slowly spinning, but are shaped like mushrooms. 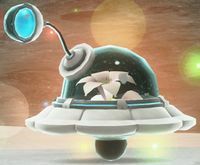 In certain levels of Super Mario 3D Land (such as World 1-3) where a pair of Binoculars are found, the player may be able to use them to spot a white UFO flying through the sky, although it eventually flies up and out of sight. In Super Mario Odyssey, a boss called Torkdrift and smaller enemies called Yoofoes are designed after UFOs. In addition, players can find small UFO-like creatures in the Moon Kingdom and Mushroom Kingdom that behave similarly to the birds of other kingdoms, in that they will fly away when Mario approaches them. The UFO in Moon Kingdom appears after activating the kingdom's Moon Rock and carries a Power Moon; in order to obtain it, Mario has to hit the creature from a distance with a downward Cap Throw. In Super Mario Land, UFOs appear in Muda Kingdom, where they are seen above Mario in the start of each land level, making it appear that he was beamed down from them. Sunken UFOs are common in the underwater level from this world. In Mario Party Advance, Mr. E helps Fly Guy to call a UFO to the rooftop of Mushroom Condo. Another UFO is buried in the earth in the Gaddget, Soil Sonar. In Mario Party 5, ID UFO presents various different shaped saucers, as the players must "identify" them. A UFO appears in Mario Party 6 in the Castaway Bay board at night near the star space. They also appear in the nighttime version of the minigame Freeze Frame. In this minigame, players can take pictures of UFOs, which are worth three points. In the Neon Heights board in Mario Party 7, if a character lands on certain ? spaces, then a UFO will appear and relocate the treasure chests. 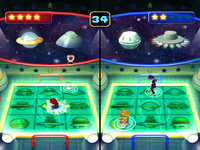 A UFO may also appear on the top screen in the minigame Rotisserie Rampage in Mario Party DS. In the minigame Launch Break from Mario Party 9, a UFO can be briefly seen flying in the outer space. It has a cylindrical shape, and a yellow star placed on the top. UFOs make a few appearances in microgames in the WarioWare games. Some examples include: Repellion and UFO Assist (WarioWare, Inc.: Mega Microgame$! ); Alien Abduction (WarioWare: Twisted! ); Wario PI and Unintelligent Life (WarioWare: Smooth Moves); and Nasalblaster (WarioWare: D.I.Y.). In Game & Wario, UFOs must be shot down in Dribble and Spitz's minigame, Taxi. Additionally, Orbulon has his own pig-shaped "UFO" called Orbulon's Oinker. The stage Fourside that appears in Super Smash Bros. Melee features a giant UFO that occasionally shows up on screen. Players can jump on top of it, although it is very slippery, and will disappear over a period of time. The UFO then reappears after some time, and players can yet again fight on top of it. On the Smashville stage that appears in Super Smash Bros. Brawl, a UFO appears at random times in the background of the stage, having no effect on the match. This page was last edited on October 21, 2018, at 23:02.